Worry is, sadly, an inevitability of life. Bad things are bound to happen, and the natural human reaction is to think about the negative consequences that could potentially arise. However, worry is rarely productive -- "it's something we do over and over again, without much resolution, and it's typically of the worst-case scenario of the future," explains Jason Moser, Ph.D., an assistant professor in the Department of Psychology at Michigan State University, who has conducted studies on worry. "There’s always an element of uncertainty, always an element of catastrophe," he tells HuffPost. Unlike fear, which has a more pin-pointable source (like a spider on the wall), people worry over "an amorphous, future uncertain threat -- something bad that might happen." While the research isn't clear on the extent to which people are predisposed to worry, it is clear that there are some personality types that are more linked to worrying than others. Neuroticism seems to be tied to worrying, for instance, as is general intolerance of uncertainty, Moser says. And while everyone worries from time to time, it is possible to worry so much that it starts to have a noticeable impact on your daily life. But even if you are a worrier, you're not doomed -- there are a number of effective strategies that worriers can use to stop the cycle. Moser and Christine Purdon, a licensed psychologist, professor and executive director of the Centre for Mental Health Research at the University of Waterloo, shared some of the most effective habits and strategies for squelching worry, as well as some common traits shared by people who aren't bogged down by it. 1. They focus on the present. Perhaps one of the biggest differences between worriers and non-worriers is the ability to stay in the present, and not get bogged down by things that have yet to happen. Purdon calls it a "worry chain" -- the idea that one worry will spur a "what if," which spurs another worry and another "what if," and so on. Non-worriers are able to look at a problem and recognize what solution needs to be implemented, "but a worrier isn't able to get that kind of distance," she explains. "The mind goes a lot faster." For instance, say your son comes home with a bad grade. If you're a worrier, you might then worry that this will cause your son to fail the class, which will then impair him from getting into college. However, if you're a non-worrier, you'll realize that the immediate issue at hand is just that your son needs to study harder in this particular class -- and that's that. "I'm able to say, 'He usually does really well, he's smart, he’s dedicated, he’ll be fine; this is a blip, not a pattern,'" Purdon says. Whereas when worriers become anxious, their "intentional focus narrows to threat cues. They can get themselves very anxious very quickly." Because staying in the present is so fundamental to squashing worry, practicing mindfulness can help you to steer focus away from a hypothetical issue that could develop down the road. "It keeps you in the here and now and it helps you be more aware of your thoughts," Purdon says. And therapy, such as cognitive behavioral therapy (CBT) and acceptance and commitment therapy, can also help worriers stop the negative cycle, since they focus "on the idea of not wrestling and disconfirming the worries, but getting people to focus on their life and values and focus on the present moment so they can make decisions," Moser adds. 3. Their brains actually function differently in a worry-inducing event. Moser recently had a study come out in the Journal of Abnormal Psychology, showing that the brains of worriers and non-worriers actually work differently in a stressful event. For the study, Moser and his colleagues had 71 female study participants answer surveys that indicated whether they were generally positive thinkers or negative thinkers/worriers. Then, the participants looked at negative images -- such as a woman having a knife held to her throat by a masked man -- as their brain activity was monitored and recorded. 4. They're more willing to take chances. While worriers have a hard time making decisions -- they take a long time because they can become crippled by all the potential negative outcomes -- non-worriers are more willing to test out solutions to a problem even if a bad outcome is possible, Moser says. In that same vein, non-worriers are also more flexible in the way they think about things, so they don't get stuck in a negative thinking rut. 5. They have a sense of perspective. Non-worriers are able to distance themselves from a situation in order to gain perspective. However, worriers can increase their perspective, Moser explains. One method for doing this is thinking of all the worst possible scenarios, and then evaluating how likely each of them is to really happen. For example: If a worrier is concerned about losing her job, she may jump to the worst-case scenario, which is that she will end up living under a bridge, homeless and alone. But Moser says that talking a worrier through a scenario like this helps her understand how unlikely that outcome is to happen. Moser suggests another simple strategy to gain perspective: Using your own name instead of "I" when referring to your emotions. For instance, saying "I'm going to fail" is harsh and doesn't allow any distance between you and the thing you're worried about. But "if you talk about yourself in the third person, you can take better perspective," Moser says. 6. They get to the root of their worry. The problem with worrying is that it can spin out of control until the thing you're worried about is 10 steps removed from your immediate issue. That's why it's so important to figure out what the real problem is in order to stop the worry cycle. "When I work with worriers, I try to work on them with problem identification, and to help them be comfortable doing that," Purdon says. "Yes, there are some problems that could lead to something else, but [let's] not worry about that right now because it's not happening right now." It's important to move from problem-generation, which is what worriers are prone to do, to problem-solving. "Worriers think what they're doing is constructive -- that by anticipating [the future problems], it's helpful in some way," Purdon says. "It's reasonable, to some extent, to do that, but they can't stop themselves once they get started." 7. 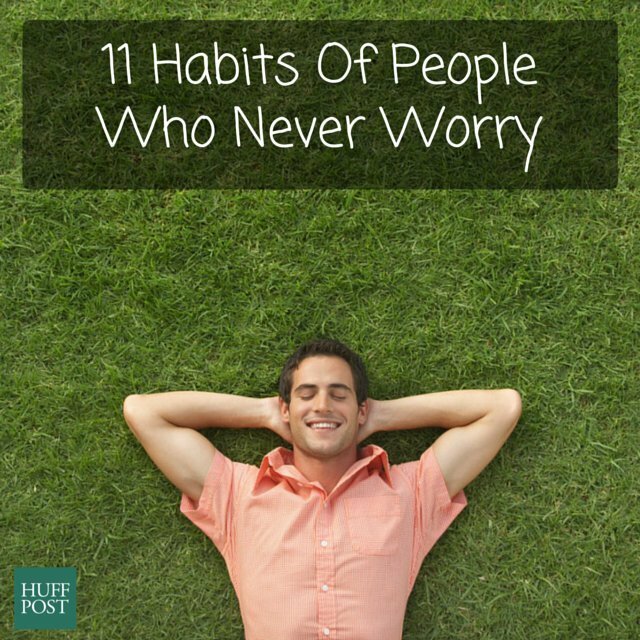 They don't stop worrying -- they just designate time for it. "One of the reasons why people engage their worry is they think, 'This is an issue I must sort out now, I have to anticipate and plan against these outcomes.' It grabs attention off what they need to be attending to, whether it be job, spouse, kids, whatever," Purdon explains. So, she recommends using a strategy called the "worry chair." It works like this -- reserve a 15-minute time during the day where you can just think and ponder over your worries on your own. Don't worry outside those 15 minutes, and make sure that you're spending your worry session in the same spot (hence the term "worry chair"!) each day. "What that means is when you're worried during the day, you can say, 'I'll think about that later. I can switch my attention off that and go on to other things,'" Purdon says. "And what they find is, 'I'm not even worried about that anymore.' But giving them permission to worry about it, but later, allows them to switch the attention away from the thought." 8. They have confidence they can handle whatever comes at them. "People with high worry not only generate ideas about what could go wrong, they also lack confidence in their ability to cope with what could go wrong," Purdon explains, adding that this is ironic considering worriers actually perform quite well in a crisis since they've spent so much time thinking about the worst-case scenarios and have normal coping abilities. Non-worriers, on the other hand, possess the confidence that if something were to happen, they'll just ... handle it. 9. They have the ability to see positive outcomes in seemingly bleak situations. Take the graphic image Moser used in his Journal of Abnormal Psychology study, described earlier. If you were to look at an image of a woman being held at knifepoint by a masked man, what do you think the next immediate outcome would be? A worrier would likely only think of the worst-case scenario, while a non-worrier would have the capacity to think, "That woman is in distress, but maybe she breaks away from her assailant and runs to safety," Moser explains. Non-worriers are able to see that there could be a positive outcome to a negative event. 10. They ask themselves the right questions. Worriers who are trying to tamp down on their worrying tendencies could find it useful to ask themselves a series of questions when they're going down a negative path. "Ask, 'Is it my problem?" And secondly, 'Do I have any control over it?'" Purdon says. "Thirdly, the next question people can ask themselves is, 'Have I already done everything about it that I can? And is it imminent?' If it's not imminent, then there's no reason to worry about it now." 11. They know how to perceive their negative emotions. "The most severe chronic worriers [are] less accepting of their emotions, which means they're intolerant of uncertainty and also find negative emotions in particular to not be very acceptable," Moser explains. Meanwhile, people who have a healthier psychological outlook tend to look at negative emotions as a sign that whatever is causing those emotions -- whether it be relationships, or work, or bills -- needs attention. They use emotions to make informed decisions.